Proddatur part of Kadapa district, Andhra Pradesh. I got a chance to visit this place a couple of weeks back. A small cozy village with small busy streets filled with shops and buzzing business. Gold and cotton are the major business over there and this place celebrates Dasara festival in a grand scale. Subramaniyam Dosa Corner - A small road side dosa stall is located near the Ammavarisala temple also known as Sri Vasavi Kanyakaparameshwari Temple in Proddatur. This shop is so much known for their super spicy delicious dosa! The first time I heard about it, I was so thrilled of the concoction of spices used and the ghee dripping dosa and made it a point to visit the shop. 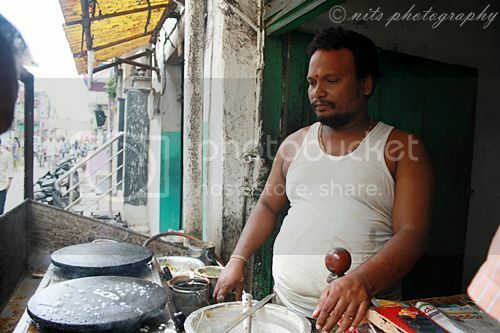 The Shop looked so very ordinary but with an extraordinary chef who was making dosas within a wink of the eye! The dosa batter seems to be a bit different. The locals say that the proportions of rice to dhall that he uses is the trade secret and no one knows it other than the chef himself. One other person said they make a porridge with soaked ground rice batter and mix it with the dosa batter to get that super crispy dosas! :) Shhhhhhhh no one knows it right! The dosa is first made on the traditional iron skillet. Not so thick nor so thin! Then it is flipped and comes the spoon full of melted ghee to roast the dosa. The dosa master then drops a dolop of red chutney made with xyz ingredients but lip smacking spice is added. Then comes the green chutney. 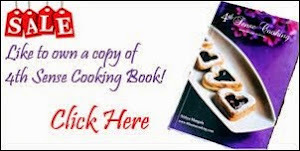 He quickly spreads both the chutneys evenly. At this point he adds more chutney if you ask for extra spicy dosa!!! I bet no one on earth eats spice like an Andhraite! Steaming spice I say!! Now again a spoon full of ghee is poured on the dosa to pacify the spice!! Oh it really adds to the taste I say. Next comes the finely chopped onion and tomato. Fresh and juicy tomatoes add so much to the taste and makes the dosa heavy into your tummy. 1 dosa is good enough for an average eater like me. Last is the super secret powder that is sprinkled generously. Almost a handful of it on the dosa makes it smell, taste and feel so good. I was really not able to guess the ingredients in the powder. Some say its dried tamarind leaf powder with other spices, but his combination is again a secret. Thats it! The ghee roast dosa is ready! :) This was super delicious and worth all the money! Oh no I dint try that :( There is always a next time and a time for you all too! Wow there are so many secret ingredients in the dosa! Diod the chef tell you what was in it? What an amazing photo blog with so many different places in our country that we have never even heard of! Proddatur isnt a village!! It's quite a town!! 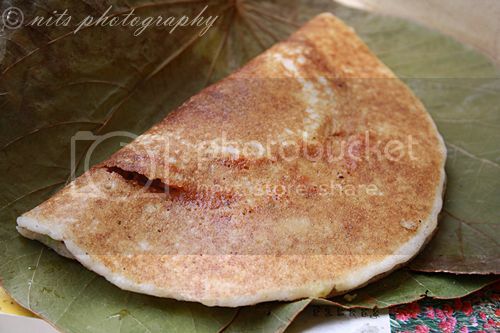 Lovely blog of the Dosas. I myself have eaten them many times and can vouch for their taste. But roddatur isn't a village. It is very much a town. Proddatur is more than a town.. I remember this dosa price started at 14 rs.. I think now it is around 300+.. Must eat dosa..
Really Amazing Dosas he makes. Every visit of mine to Proddatur does not complete without enjoying this dosa. Infact, this happens to be my in-laws place too! I was in Proddatur in my childhood and even in early 1990s, one dosa used to be some 25/- but worth every single penny. 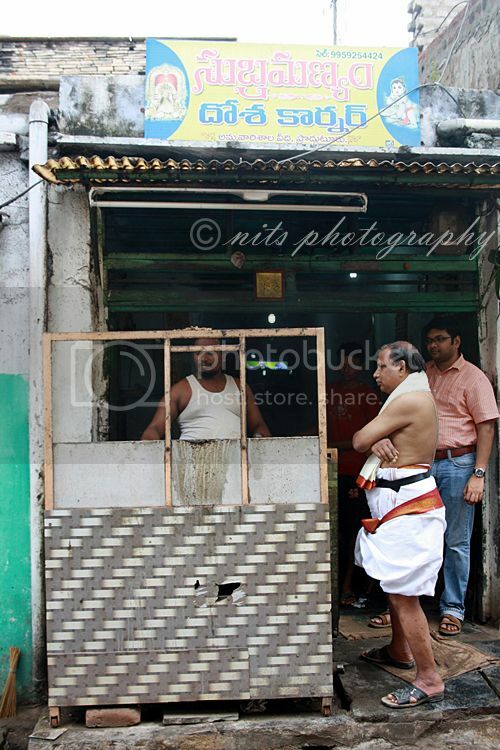 Whenever relatives come to our place, I used to rush to this subramnyam 'anna' angadi (shop).. wait for some 1 hr or so just to prove what does 'tasty' means. There are several other street food corners in Proddatur and Idly Subbarao is one such a guy who bought a mansion and a very big shopping complex only because of his tasty idles, again back in those days. Palakayalu.. papbillalu.. palakova.. ponganalu.. thangedupalli mithai.. vimurthy..karjikayalu.. my goodness.. I know people who bought gold in kilograms only because of their food businesses. They are that talented and the food will be damn yummy.